There are many wideband systems on the market today. What makes NGK's better than the competitors? Is the AFX Tuning Manual available to download? Which AFR meter should I purchase? How do I make sure the AFx meter is able to read correctly when first installed? How do I know if the AFx readings are still accurate over time? How do I make sure the AFR meter is able to read correctly when first installed? How do you know if your AFR meter will provide accurate data? Which AFR meter is the best on the market? What is the operation temperature of the sensor? When I go down a long hill the AFx reads " CAL- "? What should the AFx display while cruising steady on a flat road? Will the AFx work when my "Flex Fuel" vehicle uses E85 fuel? I have a mixture of E85 and gasoline in my gas tank. Can I read the AFR correctly? My engine is misfiring, why does the AFx show lean? Will installing the AFR sensor after the catalytic converter affect the readings? Q: There are many wideband systems on the market today. What makes NGK’s better than the competitors’? A: NGK has long been the world leader in exhaust gas sensor technology with its NTK brand oxygen sensors. Who better to create a wideband controller than the company who is the authority on wideband sensors? The benefit of the AFX comes from the many years and millions of dollars of NGK sensor research and development. Our system utilizes that technology. Don't be misled by competitors' claims of knowing the ins and outs of wideband sensor technology, or even some who simply manipulate narrow band sensor signals and call that air-fuel ratio monitoring. The AFX is a true wideband system that is rugged, versatile, and simple to use. It eliminates the guesswork from carburetor and fuel injection tuning and can save you valuable time and money. The AFX is an affordable, easy to use system that is packed with years of NGK sensor technology. Replacement sensors and parts are available through Airfuelratio.com or Powertrain Electronics, LLC. Q: Is the AFX Tuning Manual available to download? Q: What is the range of measurement for the AFX? A: The AFX has a range of measurement of 9.00:1 to 16.00:1 for gasoline. It is a precision tool that is accurate within 0.1 AFR. Q: Does the AFX have an analog output? A: Yes, t he AFX has a 0 ~ 5V, linear analog output for AFR that can be used as an input to an engine controller or data acquisition system. The analog output signal wire is yellow and is attached to terminal position 3 of the connector that plugs into the controller. The analog output ground wire is brown and is attached to terminal position 4 of the same connector. The output wires are each 12" long and are hidden inside the mesh sleeve. To access the wires, gently pull them out of the sleeve. An output of 0V means 9.00:1 AFR and an output of 5V means 16.00:1 AFR. When the sensor is in air, the analog output will be pinned at 5V (since the AFR of air is infinity). Mathematically: AFR = 1.4 x Vout + 9 . To see a graph of the analog output, click here. Q: Is the AFX compatible with leaded fuel? A: Yes. The AFX welcomes tuning using leaded race fuels. Note however that the sensor deteriorates faster with leaded fuels than with unleaded fuels. The AFX's proprietary calibration procedure helps extend the sensor's usable life and maintains accuracy throughout that lifetime. Q: How long of a life can I expect from the sensor? A: The AFX has been designed to extend the AFR sensor’s life as long as possible. However, since sensor life depends on sensor operating conditions, it impossible to predict sensor life without knowing the conditions under which the AFR sensor was used. Therefore, the AFR sensor should be considered an expendable part; a cost of tuning, just like gasoline and your time. Some tuners will never kill a sensor. Some tuners will kill two sensors a race season. You may use the AFX as a constant AFR monitoring tool, but keep in mind that this will consume the sensor faster. If you are not using the sensor to tune the engine, we generally recommend you take it out. It may be a good idea to keep a backup sensor on hand if you tune constantly or if you tune at the track. Q: Is the AFX compatible with fuels other than gasoline? A: Yes. The AFX will work with commonly used race fuels like methanol. The display will simply show AFR on a gasoline scale (using 14.57:1 as stoichiometry) even though the fuel used may have different properties (stoichiometry for methanol is approximately 6.5:1). As long as you understand this, interpreting the values should be easy. Also keep in mind that the properties of methanol may make it easier for thermal shock to occur to the sensor, possibly shortening its life. Please use care when deciding sensor mounting location. Q: What is the warranty on the AFX? A: NGK Spark Plugs (U.S.A.), Inc. warrants that the products, which it sells to the Distributor, seller, reseller, or customer, shall be free from defects in workmanship and materials within a period of sixty (60) days from the delivery thereof to the aforementioned parties. This does not apply to products that have been modified, altered, abused, damaged during transit, or subjected to conditions in excess of their intended environment. Due to the nature of the product, there is no warranty on AFR sensor life. Q: Which AFR meter should I purchase? Answer: Purchase an AFR meter that is manufactured by a company that is repeatable in the industry and able to verify the performance, and then you can use it with confidence. Also several meters should be able to read the same AFR when placed on the same engine. When you feel the meter fits your needs in accuracy, repeatability and cost, purchase with confidence. We do not recommend you purchase an AFR meter from a company that is expert in another product line. Q: How do I make sure the AFx meter is able to read correctly when first installed? Q: How do I know if the AFx readings are still accurate over time? Answer: Perform an air calibration by following the procedure in the instructions. You can be confidant the data is accurate based on the technology and engineering built into the AFx. Q:Does exhaust back pressure affect the reading? Answer: At minimal pressure the affects are very low. If your back pressure is high the first suggestion is to reduce the restriction as the engine would be seriously affected and power reduced. Q: How do I make sure the AFR meter is able to read correctly when first installed? Answer: Make sure you follow the installation and user calibration instructions for best operation and performance. Q: How do you know if your AFR meter will provide accurate data? Answer: First of all trust the manufacturer who should be the expert. If the product is from a respectable manufacture and make sure the AFR meter passed a validation test. To perform this task is very simple if you have the right equipment. The best method is to use a laboratory grade laminar flow element to measure the air flow and a precision mass fuel flow to measure the fuel flow. These instruments are in the range of $20,000 each plus dynamometer time. Install this equipment onto an engine running on a dynamometer and verify the data to the AFR meter. Subjecting the sensor to span and zero gasses is not an adequate method because combustion exhaust is different in composition and water vapor content. Also calibration gas decomposes and deteriorates over time and then the expected values are not usable. If the AFR meter is made by a company that is not able to substantiate the performance or states it works as good as “XXXX” avoid the product. Q: Which AFR meter is the best on the market? Answer: Since the introduction of the first exhaust sensor based (UEGO) air fuel ratio analyzer by Horiba Instruments literally dozens of AFR products are available. All of the AFR products offered by Airfuelratio.com are verified to perform as specified with full assurance providing and being the best in the industry. Many competitive products may be okay for a hobbyist but fall short when it comes to tuning an engine properly. If you are uncertain, ask the automobile manufactures or engine tuning professionals what AFR product they use. Q: What is the operation temperature of the sensor? Answer: The sensor is designed to function in the exhaust up to 1670 degrees F. Any time the temperature exceeds above this the sensor life will be less. It is best to keep the wires away from the high exhaust heat. Many performance engines will experience exhaust temperatures of 1350-1450 deg F at wide open throttle making power. 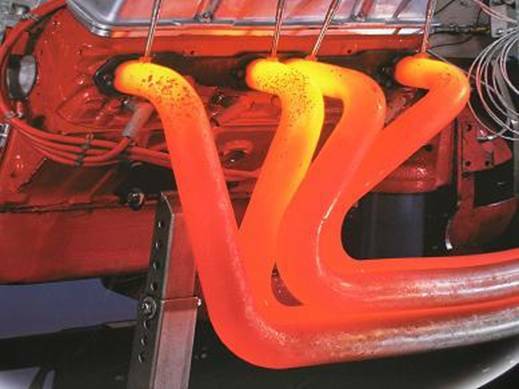 An engine must produce heat to provide power. Q: When I go down a long hill the AFx reads “CAL-“? Q: What should the AFx display while cruising steady on a flat road? Answer: Most EFI OEM vehicles when the engine is warm in closed loop. In closed loop the EFI system is trying to maintain 14.6 AFR (stoichimetric) and will toggle slightly above and below when operating properly. Q: Will the AFx work when my “Flex Fuel” vehicle uses E85 fuel? Answer: The AFx will show an AFR value on the display that is comparable to ethanol blended fuel. If you know the exact concentration of ethanol contact us for a correction table. Q: I have a mixture of E85 and gasoline in my gas tank. Can I read the AFR correctly? Answer: Since the ratio of the fuel is not known it is best to read the AFR in Lambda which is the correct method for any fuel combination. The AFx is linear and when the display shows 9.0 the lambda is 0.62 and at 16.0 is lambda is 1.10. Q: My engine is misfiring, why does the AFx show lean? Answer: If any cylinder are not working properly because of defective or worn out spark plugs, bad spark plug wires or distributor cap, then the reading are not accurate. Repair the defective part before reading any AFR data. Q: Will installing the AFR sensor after the catalytic converter affect the readings? Answer: The reading are shifted slightly but are generally less than 0.2 AFR. For most engine tuning this is a small difference and are not a large influence. Powertrain Electronics, LLC shall not be liable for any economic damages or losses resulting from the improper use of its products. *Dynojet is a trademark of Dynojet Corp.